The most fun I had in my research career was in the early days. I did a postdoc at the Microbiology Institute, University of Copenhagen, and continued off-and-on collaboration with scientists from there, especially Niels Fiil. The atmosphere in molecular genetics in those days was rather similar to today: rapid and exciting developments, new gene technologies (restriction enzymes, based on bacterial defence mechanisms—shades of CRISPR; DNA sequencing; gene cloning), and a feeling that we were at the beginning of something big and open-ended. We were studying growth regulation, and more particularly synthesis regulation of ribosomal components in E. coli, at that time the work-horse of molecular genetics. Prokaryotes don't have a nuclear membrane, so an important aspect of molecular regulation is the possibility of nearly direct coupling of transcription and translation control mechanisms. This proved to be the case for ribosomal components through the so-called “stringent response”, in which ribosomal RNA synthesis was shut down during nutritional deprivation. The discovery by Mike Cashel and Jon Gallant that guanosine tetraphosphate (ppGpp) is an effector of this response and by Bill Haseltine and Ricardo Block that it was made on “idling” ribosomes deprived of amino acids, completed the regulatory link between ribosomes and RNA polymerase. We began hunting for mutants of E. coli that escaped this so-called “stringent” growth response in order to find new ribosomal components involved in ppGpp synthesis and/or degradation. Our ppGpp assays were done using 2-D thin-layer chromatography 32P orthophosphate in open plastic dish pans (Ah, for the good old days). 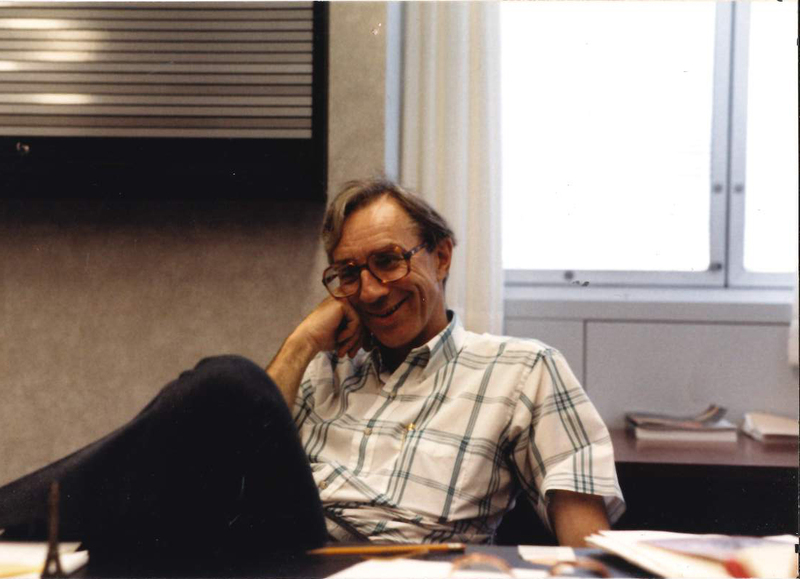 "The atmosphere in molecular genetics in those days was rather similar to today: rapid and exciting developments, new gene technologies, and a feeling that we were at the beginning of something big and open-ended"
Professor James Friesen pictured in his office at SickKids in 1988. In parallel, we began studying the biosynthetic regulation of the structural genes for ribosomal proteins and translation-factors. For this we needed to identify the genes coding for individual ribosomal proteins and rRNA, determine their genomic position in relation to each other (remember operons?) and then study their biosynthetic regulation. Our first gene cloning was done Nature's way using λ specialized transducing phages, selecting for nearby nutritional markers and then screening for the presence of ribosomal genes. When restriction enzymes became available (at first we had to make our own crude extracts for some of them) we could cut up the E.coli genome and clone on to plasmids, again selecting for nearby markers. However, subsequent localization of genomic regulatory elements and operons, and determination of operon gene-order was much easier using this method. Sequencing by hand using the Sanger method verified the gene orders and also was a fast short-cut to finding the amino acid sequence of ribosomal proteins as a first step to determining their function. This was thought to be important because this era was decades before it was shown that RNA was the catalytic agent, rather than proteins; at the time everybody thought it was the other way around. We showed (as did Masayasu Nomura) that ribosomal protein synthesis was controlled by a feedback translational mechanism. As a basis for development of new antibiotics there is a current interest in research on bacterial growth regulation. Every once in a while I see a reference to one of our forty-year-old papers on the subject—quite a thrill. Later on, I switched to yeast and started by isolating genes of the transcription and translation systems. But that's another story. Friesen JD (1968) A study of the relationship between polyribosomes and messenger RNA in Escherichia coli. J. Mol. Biol. 32:183. Friesen JD, Fiil N (1968) Selection of relaxed mutants of E. coli. J. Bacteriol. 95:729. Friesen JD, Fiil NP, Parker J, Haseltine WA (1974) A new relaxed mutant of Escherichia coli with an altered 50s ribosomal subunit. Proc. Natl. Acad. Sci. USA 71:3465. Watson RJ, Parker J, Fiil NP, Flaks JG, Friesen JD (1975) New chromosomal location for structural genes of ribosomal proteins. Proc. Natl. Acad. Sci. USA 72:2765. Friesen JD, Fiil NP, von Meyenburg K (1975) Synthesis and turnover of basal level guanosine tetraphosphate in Escherichia coli. J. Biol. Chem. 250:304. Reeh S, Pedersen S, Friesen JD. Mol Gen Genet. (1976) Dec 22;149(3):279-89. Biosynthetic regulation of individual proteins in relA+ and relA strains of Escherichia coli during amino acid starvation. Parker J, Friesen JD (1980) "Two out of three" codon reading leading to mistranslation in vivo. Mol. Gen. Genet. 177:439. Parker J, Pollard JW, Friesen JD, Stanners CP (1978) Stuttering: Mistranslation in mammalian and bacterial cells. Proc. Natl. Acad. Sci. USA. 75:1091. Ingles CJ, Himmelfarb HJ, Shales M, Greenleaf AL, Friesen JD (1984) Identification, molecular cloning and mutagenesis of Saccharomyces cerevisiae RNA Polymerase genes. Proc. Natl. Acad. Sci. USA 81:2157-2161. Mamelak L, Christensen T, Fiil N, Friesen JD, Johnsen M (1984) Alternate mRNA secondary structures as a mechanism of translation-inhibition. In: "Molecular Biology of Bacterial Growth" (M Schaechter, FC Neidhardt, J Ingraham, NO Kjeldgaard, eds.) Jones and Bartlett Published, Inc.
Fouser LA, Friesen JD (1987). The effects on mRNA splicing of mutations in the 3' region of the S. cerevisiae actin intron. Mol. Cell. Biol. 7:225-230. Himmelfarb HJ, Simpson EM, Friesen JD (1987). Isolation and characterization of temperature-sensitive RNA polymerase II mutants of Saccharomyces cerevisiae. Mol. Cell. Biol. 7: 2155-2164. Climie SC, Friesen JD (1988). A region of mRNA secondary structure is necessary for feedback regulation of the L10 ribosomal protein of Escherichia coli. J. Mol. Biol. 98:371-381. Climie SC, Friesen JD (1988). In vivo and in vitro structural analysis of the Escherichia coli rplJ mRNA leader: protection by bound L10-L7/L12. J. Biol. Chem. 263:15166-15175. Xu Y, Petersen-Bjorn S, Friesen JD. (1990) The PRP4 (RNA4) protein of Saccharomyces cerevisiae is associated with the 5' portion of the U4 small nuclear RNA. Mol. Cell. Biol. 10: 1217-1225. Archambault J, Schappert K, Friesen JD. (1991) A suppressor for an RNA Polymerase II mutant of Saccharomyces cerevisiae encodes a subunit common to RNA Polymerase I, II and III. Mol. Cell Biol. 10: 6123-6131. Archambault J1, Friesen JD. (1993) Genetics of eukaryotic RNA polymerases I, II, and III. Microbiol. Rev. Sep;57(3):703-24.